Metal fencing can have a galvanised finish, or can be galvanised and then powder-coated in a very wide range of colours it can be used for decorative purposes such as railings with, for example, an attractive bow-top or ornate finial. Also for higher security applications, including industrial premises it can be used and topped off, if required, with anti-vandal scaling barriers. 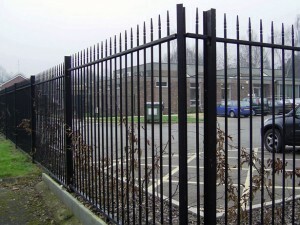 Most metal fencing can be made to just about any shape, contour, size, and colour. We can also supply and install a wide selection of gates, both automated and manual, that can be integrated with your preferred style and colour of fence. 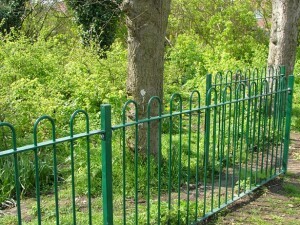 Additionally we can match most existing fences, or custom manufacture to order. Metal bow top fencing is a security fencing but with a safe round bow top. 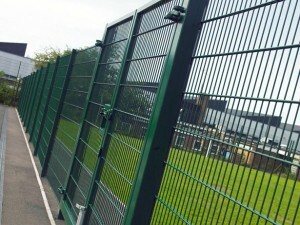 It combines security with looks by creating a solid secure but aesthetically pleasing fencing. It takes its name from the rounded tops which create a bow on the top of the fence. Typically used as permanent security perimeter fence in area where the fence is seen by public or is very visual. Ideal for public and recreational areas. Security bar fencing fencing is perfect if you require a solid long lasting boundary fence. It comes in many designs and variations. The bars can come in many shapes and sections from round tops, blunt tops to spikes, or even cranked tops. We can also always manufacture a bespoke design to suit your requirements. 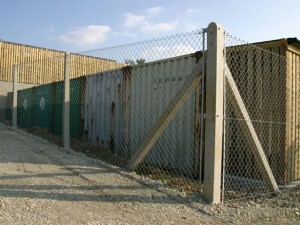 Often used as Perimeter Fencing for Retail Outlets, Commercial Business, or New Build Housing. A high level security fencing, Steel Palisade Fencing is commonly seen and used for industrial strength security. Available in many different powder coated colours or just in a galvanised finish. The pales can come with different shaped tops, round top or pointed are just 2 examples available. Security Mesh Fencing is becoming more commonly used instead of chain-link fencing and steel palisade, it is very versatile and modern alternative. The panels create a solid and stylish perimeter fence. It comes in whole panels sections which means they are strong, secure and sturdy. Available in many different specifications and colours. Used in Public areas, Sports and leisure facilities, Play areas, Schools, Colleges, Airports and Industrial sites. Chain link fencing although not as common today as in the past. It has been used on industrial and commercial properties for many years. chainlink is commonly known as a secure boundary fence as well as many other applications. 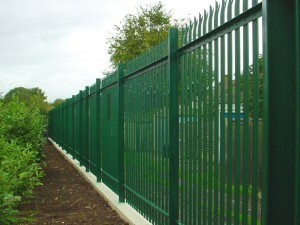 This fencing is a available in a variate of wire gauges and finishes, including green plastic coated and galvanised. It can be installed on angle iron chain link posts or on concrete posts for chain link. The chain link fence allows clear visibility through it and although soft on the eye it still provides a high security and deterrent hence why it is very popular as a sports fence, tennis courts or as a security fence & industrial sites. We can design, manufacture and install compliant handrails and railing to meet your specifications. 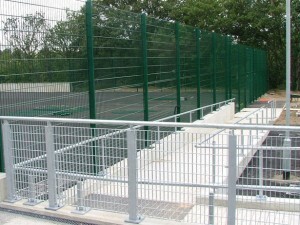 Railings to provide security and support but also be visually attractive from Ornate steel handrails, Step and Ramp Handrails to Hooped vehicle barriers to pedestrian guard rails. We can also offer complete bespoke solutions to suit your requirements.